Holly & Jamie Johnson both travelled to Guernsey to represent Scotland at the British Primary School Championships 2015. Jamie teamed up with Rayyan Khalid, Rafael Wolowski & Yifie Fang in the boys teams event with Holly competing the girls team event with Holly Stevens, Amelia Smolarek & Charlotte Burridge. The girls team finished in a creditable 4th place behind England, Ireland & Wales with Holly picking up her first wins in a Scotland jersey against the home team Guernsey & Isle of Man. Jamie and co finished the team event with a Silver medal and finished ahead of arch rivals England and Wales, with only a strong Ireland team running away with the Gold medal. 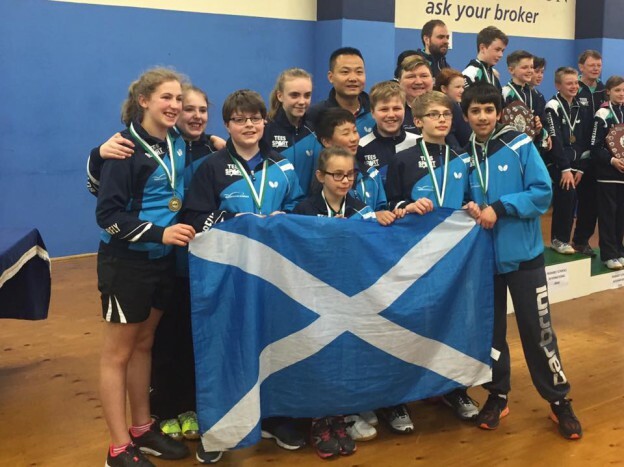 Jamie highlight in the team event was providing 2 wins from his 3 matches against England which played a contributing factor in team Scotland getting a 5-5 draw v England. In the singles event, Jamie Johnson & Holly both did well and qualified from their groups where they met top ranked players from England & Ireland in the last 16. Both players put up a good showing but Jamie lost to Naphong Boonyaprapa (Eng) 11- 4, 11-6, 11-8 and Holly lost Silke Heinen (Ire) 11-4, 11-6, 11-9. British PS Championships is always a fantastic weekend for all players and a experience that Holly & Jamie can build on in the future. Both players are still eligible to qualify next year to represent Scotland again and will be aiming to do so. To view pictures and full results from the team events and singles, visit Guernsey TT website www.gtta.org.uk.